Some features are available only in the premium package, which can be purchased right from the app, using Google Wallet. More info on this is listed under “Premium Features“. In these screenshots, “Despotica” is the name of my home Wi-Fi network. The signal level is displayed in color, which is easier to see at a glance than Android’s built-in Wi-Fi signal level indicator. Signal strengh can be displayed as: image, dBm, percent. The widget is available in four sizes (1..4 by 1 cell) and several themes (“HTC Sense” like, two Holo themes like Android 4.0, two premium Material themes like Android 5.0). The widget with a “light bulb” icon is used for switching among your favorite networks with a single tap. Clicking the “main” widget anywhere but on the switch brings up the Wi-Fi manager part. The main screen has two modes: list mode and radar mode. 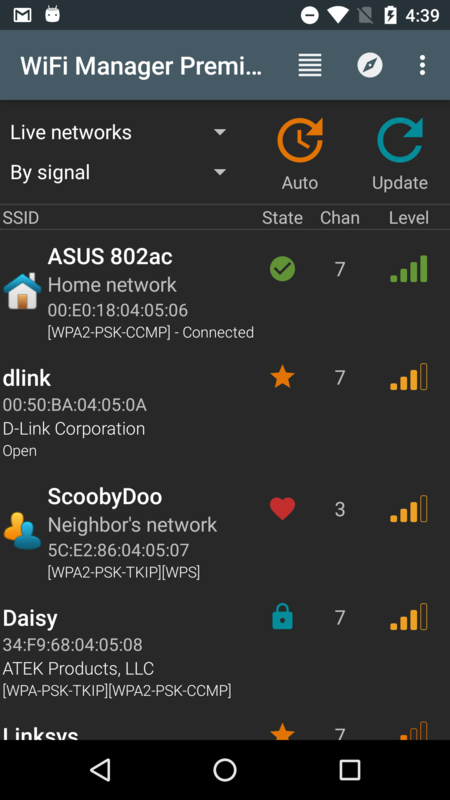 In list mode, the app displays a list of Wi-Fi networks: either results of a live scan, or networks “known” to Android (previously connected to). Networks can be sorted by name, signal strength, or open first (and then by signal strength). Clicking a network item allows you to perform various actions, such as connecting (or disconnecting, optionally removing it from the “known” network list). Long-pressing on a list item brings up advanced options for that network. You can change the password of a known network, assign a description or an icon to a network, exclude it from the list (neighbors have routers, too), or set it up for fixed or dynamic (DHCP) IP address. Some of these features require an in-app purchase. There is an auto-update function with configurable interval ranging from 3 to 60 seconds. You can configure a sound notification for when new open networks are discovered. Tether widget disabled on Android 8.0+ (thanks Google for a “security improvement”). Display network hardware vendor names. Can be turned off in settings. Backup and restore of per-network descriptions and icons to / from a file. In the menu. Had to add the “storage” permission. 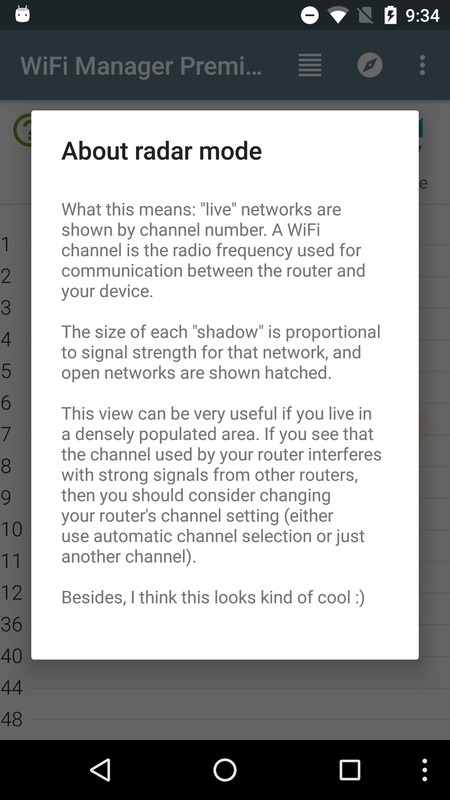 Channel width info (Android 6.0+). Bug fixes: in particular, “access point / tethering” widget. Turned off full-screen ads (in the free version). Added support for Android’s “backup and restore” feature for per-network descriptions and icons. 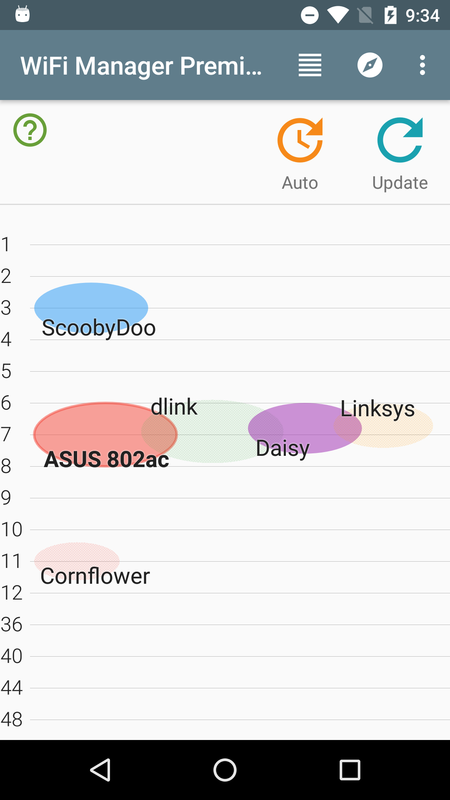 New: a widget to toggle “best network switcher”. New: a setting to make any “just now gone out of range” networks “linger” on the list for a bit. New: the notification (if enabled) will use the connected network’s icon (if assigned). New: “best network switcher” can be restricted by current network’s name (a list of regular expressions). New: “temporary connection”, a network will be forgotten on next WiFi off / on cycle. Finally (!) supports distinct networks with same name (SSID). 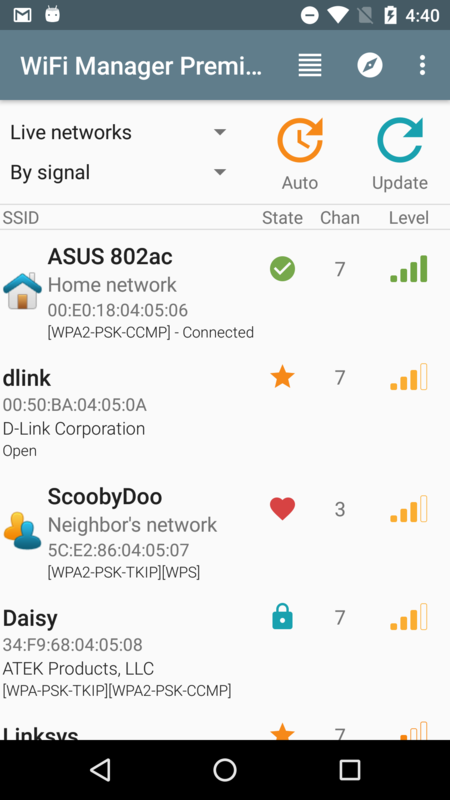 Description and/or icon can be set for a specific network (per BSSID). Improved compatibility with Android 6 and newer. Refreshed the design a bit. Connect speed info in the notification. Now requires Android 4.1 or newer. Android 6 specific code now merged into same app version. So far only released to 6.0 devices (just to be safe), the rest should follow soon. A simple widget for controlling Bluetooth state and settings. Comes in two sizes: 1×1 can act as a simple toggle switch, and optionally provide access to system Bluetooth Settings, whereas 2×1 has a separate button on the left to for the Settings screen. Several widget themes: “material design” (like Android 5.0), “holo” (like Android 4.0), and “HTC Sense” style. High-res graphics for full-hd phones. Minor adjustments to 1*1 “two in one” widget layout. Added one more widget theme, like the old one, but with blue icons. Added two new widget themes, inspired by Android 4.0. The “gears” icon was created by Gorge Bergman, and is used under permission. The lightbulb icon comes from OpenIconic icon set. Since my mobile upgraded to Android 9 a few days ago, the transparency in the widgets no longer works. I am running 4.2.6-213 on a OnePlus 6. Fixed in version 228 which is available on this web site.